Kathy Duva, Main Events CEO: "We have a new chapter opening for us and also a new one for Zab Judah as well. On March 5th we are going to be back in Newark and Zab is going to become a world champion again. Main Events along with Zab is going to be opening a new venue at Prudential Center, it's called the Amerihealth Pavilion. We are very excited about that." "Many years ago Main Events made a name for itself by putting a fight in an ice rink in Totowa, NJ. Well this building also doubles as an ice rink. It's going to be a space for athletic events, concerts, comedy and all kinds of shows. Underneath the floor will be an ice rink for this first show, because it's still hockey season, so it's going to be familiar to some of us. It's going to be a great night kicking off this tremendous venue. I think it's going to become the new millennium's version of what Ice World used to be years ago: an incubator for new talent coming up. And I can't think of a better way to open than with a world title fight featuring Zab Judah vs. Kaiser Mabuza, who's coming all the way from South Africa to fight him (Zab)." Zab Judah: "It means a lot to me to be put in this position (to become world champion). Kaiser Mabuza is a very tough fighter. He brings a great style to the ring of boxing, and he brings exciting fights. He's known as a home wrecker and he's coming across the world, so I know he's coming in 100% prepared for us. 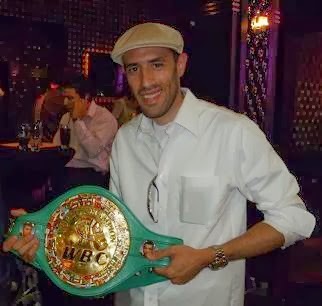 I know he's gonna try to come in there and win his first world title, but Zab Judah is in there and I'm looking to become the 5 time champion of the world. I'm not gonna stop." "You know I'm not joking, there's nothing amusing here. Kaiser Mabuza is a fighter who made his way to the number one spot in boxing. There's nothing I can take away from that, there's nothing you can take away from that. The man has made his way up there to become the number one fighter in the world. I'm number 2. He's higher than me already and I'm going to surpass him come March 5th, but right now the man is number one in the world. So you have to give him his respect, because he made his way there." "My last fight was Lucas Matthysse, another fighter people didn't know anything about, but now you guys know about him. With Matthysse everybody was saying to me, 'he's nobody, nobody knows him'. But now people see he's a very rugged, tough, strong puncher, and like I said the guy has exceptional punching power. I know he's got another fight coming up. Watch, you'll get another look at him with another opponent with a different style and then you guys will say 'well damn, the only person who could beat him was Zab'. Then you guys will give me props. Same thing with Kaiser Mabuza, he's an action- packed fighter, he's coming in here, this is a major opportunity for him. He sat around and waited for the opportunity for a long time and I know come March 5th, Kaiser Mabuza is not coming all the way from South Africa to lose." "These guys Matthysse and Mabuza, people side stepped them because they're not familiar with them, because they're from different countries and they were doing things over there. People say, 'I'm not fighting them, they're nobody', but evidently they are somebody, because they made their way up to the position they are at right now." "Training camp is going well. We picked up a helping hand, Pernell "Sweetpea" Whitaker. He will be a new member of Team Judah. At this point I'm just taking experiences and sapping knowledge everywhere we go, sucking it all up. I need it. I'm going to get the best, to be the best." Kathy Duva: "Pernell was thrilled when he found out that Zab was interested in bringing him in. There's probably nobody in the world that can build a game plan better than Pernell Whitaker. He can see everything. I think in Zab he has found a student who can actually execute everything he wants him to do, which hard for someone like Pete (Pernell) to find. There aren't very many fighters that could actually do the things that Pete could teach him. I think of Pete as sort of a great concert pianist, he isn't going to be satisfied teaching students to play Chopsticks, but if he can find a student who can play that concerto the way he did, then he can really teach him something. That's what this pairing is. I think it's absolutely inspired and a wonderful idea. I know Pete is as thrilled about it as we are." Zab Judah: "This man (Mabuza) is coming in here to fight, this gonna be a good fight. But just know that I'm ready, I'm working hard. I'm back doing my running; I'm back in the mountains training. We're in the gym now everyday. My life has changed." "I know it's his (Mabuza) first opportunity to become a world champion. We are expecting a tough, 12 round, action-packed, non-stop-punches fight. This is what makes great fights."